Customer Service and Support from Opti Temp, Inc.
Opti Temp refrigerated chillers and non-refrigerated heat exchangers are backed by customer service and support which is second to none. In the unlikely event you experience difficulties with your Opti Temp cooling system, rest assured our knowledgeable staff of thermal management engineers and technicians are available to assist you. Our telephones are answered by people, not computers. Our goal is the complete satisfaction of our customers. Our service department technicians will be able to take your service and assistance calls during normal business hours, 8-5 PM Eastern Standard Time. The service number for Opti Temp is (231) 946-2931 or you can e-mail the service department: Service@OptiTemp.com, Before calling or e mailing service have your serial number ready-found on the back of you heat exchanger or chiller. Call Opti Temp at (231) 946-2931 for diagnostic assistance. 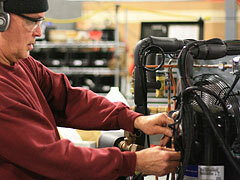 Before calling or e mailing service have your serial number ready-found on the back of you heat exchanger or chiller. If an instrument, pump, or miscellaneous hardware is determined to be at fault, a new or reconditioned part will be sent as a replacement. Customer will provide labor and any additional parts needed. Return the defective part freight pre-paid for a full credit. If it is determined that the complete thermal unit needs to be returned to Opti Temp, customer must package and sent to Opti Temp, freight prepaid. An RMA must be obtained from Opti Temp prior to shipment. a. Purchase a new device from the original device manufacturer as a replacement. b. 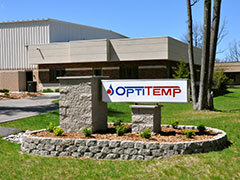 Order a replacement part from Opti Temp. If it is determined that the complete thermal unit needs to be returned to Opti Temp, the customer must package and send it to Opti Temp, freight prepaid. 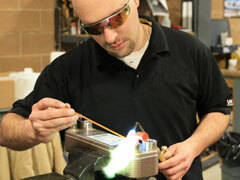 An RMA must be obtained from Opti Temp prior to shipment. There will be an initial inspection charge of $595.00, plus parts and labor. After evaluation Opti Temp will communicate to customer the issues found and price to repair.The unit will be repaired, tested, and shipped back to the customer, freight collect.